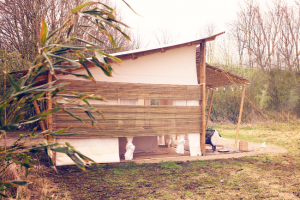 Are you looking for answers about our Mocadazu bamboo glamping tents? Answer: We have several types and sizes of tents, each with a different price. If you let us know which model and size you are interested in, we can make you a quotation. You can contact us by sending us an e-mail through design@mocadazu.com or by filling in the contact form at the bottom of each page on the website. Prices of the tents exclude platforms, electrical, plumbing, interiors, fixtures, appliances, setup, shipping costs, VAT, import duties, taxes, other duties and related costs. All tents are quoted in Euros. Answer: Shipping costs are variable costs, depending on port of destination, type and size of tents and quantity. Shipping costs also vary over time. This is why shipping costs are never included in the prices of our products. We need to ask our shipping agent for a freight quotation for each order separately. Please note that import duties, taxes, VAT and other costs related to shipping/import at the port of destination are not included in the freight quote estimate that we will send you. 3) How much do your tents cost per square meter? Answer: Prices per square meter of our tents vary, depending on type of tent and size. Some tents cost more then others per square meter, since each tent price is calculated differently. Prices are based on the structure, material costs, labour and complexity to manufacture. There are several custom options such as windows, openings, insulation, furniture, etc that affect the price. 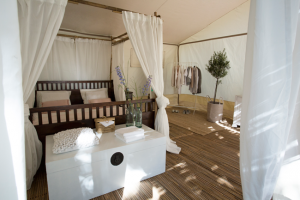 Answer: Our standard glamping and resort tents range from 21 square meters to 72 square meters. Our standard pavilions range from 6 square meters to 125 square meters. Larger tents and pavilions are available upon request. Answer: Yes, we have a digital brochure that we will send to you upon request. If you wish to receive a digital brochure, please contact us by sending us an e-mail through design@mocadazu.com or by filling in the contact form at the bottom of each page on the website. Most of the information is also available on our website. If you need additional information, feel free to contact us. Answer: Our tents are made and shipped directly from our factory in The Netherlands to any destination port worldwide. We handle all freight logistics all the way to the destination port, where you or your local agent takes over to clear customs and arrange for the local delivery. Answer: Most of our tents normally take about 6-8 weeks to manufacture, depending on model and quantity. Shipping times vary depending on the port of destination. On average, it takes between 30 and 45 days to ship your order via ocean freight. Airfreight is a significantly faster option, but it is also more expensive. Answer: Once you have decided which type of tent(s) and how many tents you require, we will send you drawings and details of the required tent(s) for you to approve. Once the drawings and details are approved we will send you the invoice for the total cost of the tent(s) and any additional products or services, including the payment terms. Our payment terms are 50% down payment at the time of placing the order, and 50% before delivery or shipment. Freight costs are due just prior to dispatch of the tents from the factory. All orders are only processed into production after the down payment has been received. Answer: Please contact us immediately if you wish to make changes in the placed order. We will always do our best to incorporate any changes, but for each change after the order has gone into production there are cost involved. This is because it holds up the production lines and also requires changes to be made to the technical drawings that direct some of the machinery. These costs vary depending on type and extent of the changes. Answer: This is up to you. We can provide you with set-up instructions so you can do the set-up yourself. We can also send a team to the location for installation of the tent(s). We do charge for this installation service and you are also required to cover all the costs for travel, lodging and expenses. Answer: We can do this at the customer’s request, but we do charge for this service. You are also required to cover all the cost for travel, lodging and expenses. Site inspections are more common for customized or very large projects, with custom deck and lodge design. Answer: Most of our tents take 1-3 days to set up, depending on type and size of the tents, assuming that the deck is already built. Customized tents, insulated tents or tents with actual windows and doors can take longer to set up. Frame: treated and finished Guadua bamboo, Ø 8-10 cm. Connections: aluminum and galvanized steel connections. Fasteners: galvanized steel bolts and nuts M10 – 8.8. Inner tent: TenCate cotton/polyester fabric or Sauleda acrylic fabric, mildew resistant, off-white color. Roof: high quality PVC ca 700 g/m2, sandy beige color. Awning. Large awning of either PVC fabric or thin bamboos (depending on model of tent) to protect from sun and/or rain. Ropes: high quality geotwist hempex rope. Extra roof support: extra aluminum tubes in the roof for an extra strong roof construction. Roof: PVC roof is standard made of fire retardant M2 and opaque PVC fabric. Detailing: high quality detailing, such as leather straps, lace curtains and extra bamboos. Answer: Yes, we can also make custom tents. For a custom tent, we need to make a design, technical drawings and a prototype. We also need to consult our structural engineers and tent manufacturers during this process. Furthermore, custom designs might require wind and structural engineering approvals. The design and manufacturing process for customized tents is longer than making a standard designed tent. Please note that you will need to cover all the additional costs for making a custom tent. Answer: Yes, standard designs can be customized. On our standard tents, you can choose the colours of the fabrics, of both the inner tent and the roof. Windows, doors and openings can be customized too. Some colours or adjustments may cost extra. Please contact us to discuss the possibilities. Answer: Yes, our tents preferably require a wooden deck/platform or concrete base to be built on. It is important that the tents are secured to a solid base to prevent them from flying in case of wind. Answer: We can supply the wood and materials needed to build the deck, but we recommend that you source this out locally. In most cases both the material as well as labour will be cheaper locally. Also, it will save you on shipping costs. If you were to encounter any problems with the decking/plans, they can be dealt with on a one-to-one basis rather than through us. This ultimately saves you time, money, and the hassle. Answer: Our tents don’t come as standard with insulation. We can insulate the tents by using a double-walled inner tent, with a layer of insulation material in between. An insulated tent will be more expensive, as it needs double the amount of fabric for the inner tent, plus the insulation material. Insulating a tent is only useful if actual doors and windows are included. 19) How do you heat the tents during a cold winter? Answer: It is possible to place a heater in the tents, but since the walls are made of fabric it will not be possible to heat the tents more than a few degrees. For colder climates it is possible to combine a heater with insulation, to keep most of the heat inside. We recommend using space heaters, propane heaters, or a centrally ventilated heating system. We don’t recommend using open flame to heat the tent, since the walls are made of a fabric and this can increase the risk of fire accidents. 20) How do you cool the tent down in the summer? Answer: It is possible to place a fan or air conditioning in the tents, but since the walls are made of fabric it will not be possible to cool the tents more than a few degrees. For hot climates it is possible to combine a cooling system with insulation, to keep most of the cold air inside. For solid fan or air conditioning placement we can add reinforcement in the structure. This may cost extra, depending on your preferences. 21) How long do the tents last? Answer: This really depends on the specific location, weather conditions and maintenance. Our tents can last a lifetime if taken care of properly. 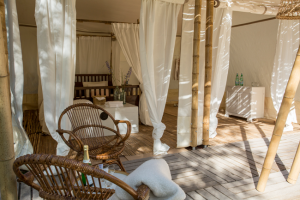 This includes keeping the fabrics under proper tension, varnishing the bamboo and keeping the tent generally clean. The tents are all made of several components that are individually replaceable as they might weather. 22) Can the tents handle wind? Answer: Yes, the tents perform well in the wind. If the winds get really high you can add extra guy ropes for extra stability. In case of extreme storms it might be wise to break the tents down. If the tents are placed at a location where there is strong wind at all times, please contact us so we can discuss the possibilities to make the structure even more windproof. 23) Can the tents handle snow? Answer: Yes, our standard tents can handle a little bit of snow. If the tents are set up in an area with lots of snowfall, we can reinforce the roof structure or increase the slope of the roof. Please contact us to discuss the possibilities. 24) Can the tents handle heavy rainfall? Answer: Yes, the tents can handle a lot of rain. The roof is a strong PVC fabric that is fully waterproof. The roof is tensioned straight, it is sloped and the PVC fabric is smooth, resulting in rain easily running off. 25) Can the Tents handle a lot of UV (sun)? Answer: Yes, our tents can handle sun with ease and are UV protected. The bamboo frame is treated with a varnish to protect it from the elements. Like with wood, this varnish needs to be reapplied every so many years, depending on location. The PVC roof is a strong and UV proof fabric that can withstand intense sun. 26) Are these tents fire proof? Answer: It is possible to apply fire retardant coating to the fabrics. This doesn’t make the fabrics non-flammable, but it prevents fabrics from dripping. However, they are fabric structures and able to burn down like any other structure. It is best to ensure that one has good quality fire extinguishers at all strategic points. 27) How secure are your tents? Answer: Our tents are able to have wooden doors installed to make the tent more secure. Be that as it may if someone wants to break in to the tents, they surely will. We recommend surveillance or some sort of motion detecting lights/alarms inside/outside the tents to enhance security. For storage of your guests’ valuable items we recommend to install a safe that is attached to the platform. 28) Do you sell used tents? 29) Do you keep stock of your tents? Answer: No, we don’t have tents in stock. All our tents are made to order. This means that it will be possible to make small adjustments in the design, but it will always take some time to manufacture upon order. 30) Do you have a show room? Answer: We don’t have a showroom, but we have some tents on location in The Netherlands that you are always welcome to visit. Please contact us for more information. 31) Do you offer a volume discount? Answer: Yes, we do offer volume discounts, depending on tent design and quantity. 32) Do you offer wood deck/platform designs? Answer: Yes, we offer standard platform designs for each tent model/size. If you choose to source platform material and labour locally, we provide you with the drawings for the platforms, so you know exactly what the size should be and where you need to make reinforcement for fixation of the tent structure. We can also make you a customized platform design at additional costs. 33) Apart from the tents what else do you supply? Answer: We can also offer interior packages, platforms, bathrooms, kitchens, insulation and actual doors and windows. However, sourcing (some of) these items locally might save you on material costs and shipping costs. We do offer installation of the platforms and installation of the tents. Plumbing, electrics, etc are never supplied by us. 34) Can rainwater be harvested from your tent structures? Answer: This is not a standard feature in our tents, but it is possible to implement such a system in most of our tent designs. This might influence the aesthetics of the tents and comes at additional costs. 35) Are your tents considered “Temporary Structures”? Answer: Yes, in most countries the tents can be classified as temporary structures, however this can differ from country to country. Please consult with your local authority to learn about regulations and whether permits etc. are required. 36) Can your tents be taken down easily? Answer: Our tents can remain installed year round, but it is also possible to take the tents down. We have created a building system that allows for fairly easy set up and break down. Most tents take about 1-2 days to break down, depending on model and size. Please take into account that if you have a fully furnished tent, with bathroom and kitchen, these items need to be dismounted and stored too. 37) What questions can be answered to better help us serve and understand your tent requirements? What is the location where the tents are to be set up? Is the location close to the ocean? What is the climate at the location? What kind of terrain and vegetation type is at the location? Which of our tent design(s) do you prefer? How many people do the tents need to accommodate? What square meter area is your preferred size for your tent? How many tents are you looking for? Is your tent project for personal use or for a resort/lodge development? Are you also looking for tent(s) for an office, reception, bar, dining or lounge area? Do you have any pictures of the location? Please let us know what kind of information you would like to receive. We will send you our digital brochure. 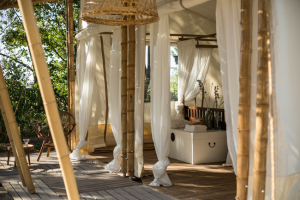 If you would like to receive specific information about one of our luxury bamboo eco resort tents or eco glamping tents, you can indicate this below. Of course you can also contact us directly! We can be reached via design@mocadazu.com .